On the afternoon that Bob and I landed in Rome, Italy, we were in dire need of a stretch given the long hours of travel time from Toronto . Our accommodation, Hotel Manfredi, was centrally located in the Old Quarter so The Spanish Steps were less than ten minutes by foot from the hotel lobby. It seemed a likely destination given its close proximity. 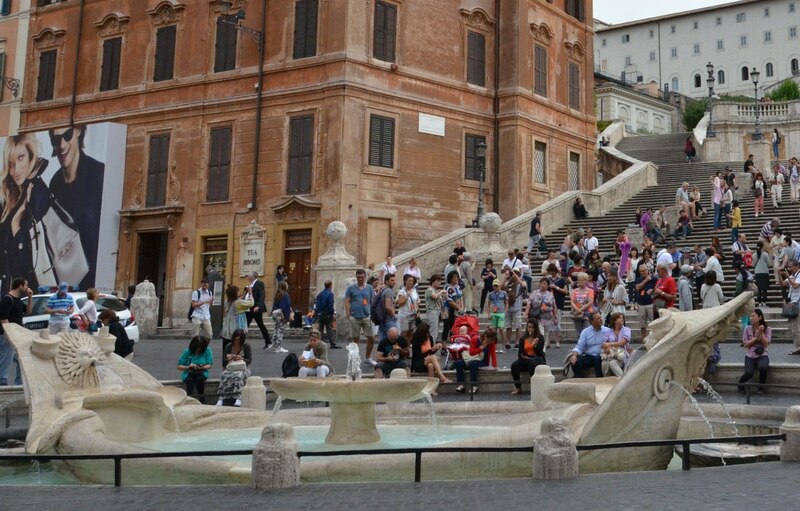 When we broke out into Piazza di Spagna, the first thing we saw were hundreds of people jamming the square, seated on the steps, and clustered around Fontana della Barcaccia (Fountain of the Ugly Boat) at the base of the Spanish Steps. 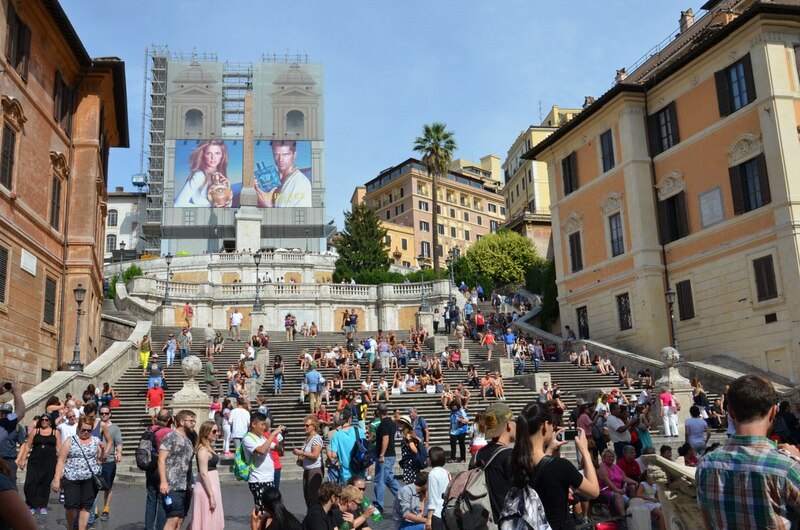 The Spanish Steps make up the widest and longest staircase in Europe, so it was a must that we climb them. I mounted the stairs briskly, pausing for breath along the way, and can vouch for the fact that there are 135 steps. 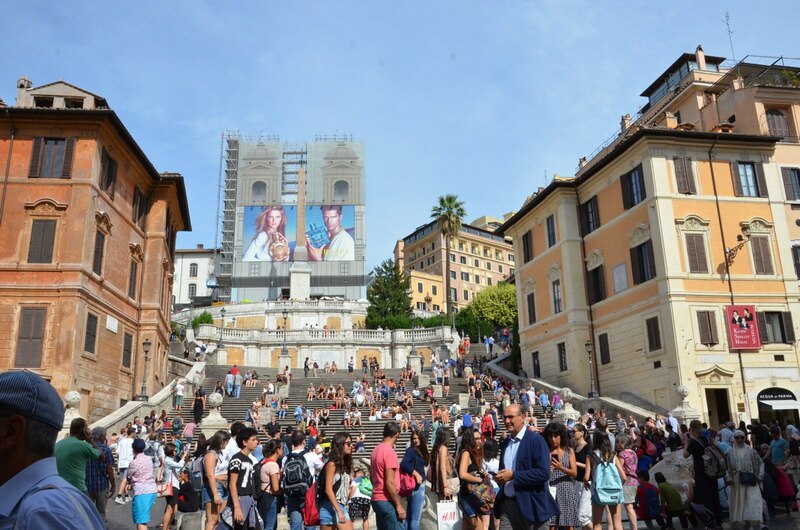 The mix of elegant curves, straight flights, terraces and stunning vistas were put in place as a means to ascend the steep slope between two piazzas, the one at the top named Piazza Trinita dei Monti after the church that dominates the skyline with its twin towers. Only a canvas mural of the church spires was visible owing to ongoing restoration work, and sadly, even that was obscured by a huge billboard. 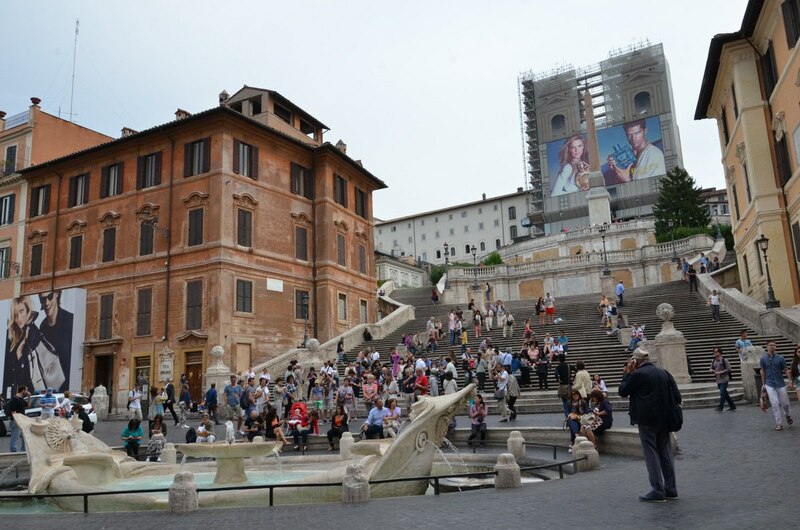 I was already swimming in history, if you’ll pardon the pun, for the fountain built at the bottom of the Spanish Steps represents a half-sunken boat like the riverboat or barcacce that ended up in Piazza di Spagna when the Tiber River flooded in 1598. That was the inspiration for the design of this fountain and its name, Fontana della Barcaccia. Technically built in 1627-1629 by Pietro Bernini, the original idea was thought up by Pope Urban VIII. 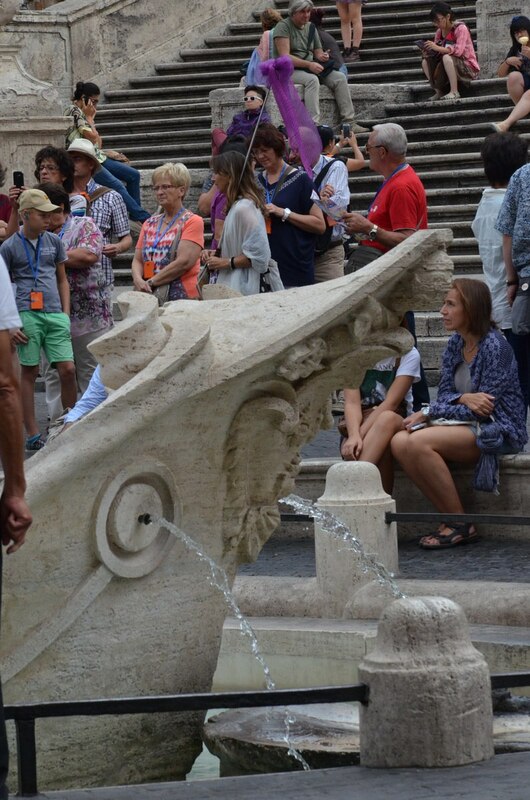 Pietro Bernini did not take all the credit for the fountain’s baroque design. His son, the more famous Gian Lorenzo Bernini, also gave input on the decoration. The fresh-water fountain has water “overflowing its bows”, a reminder of the historic and disastrous flood that stranded riverboats in that very place. Partway up the Spanish Steps is a broad terrace with a substantial balustrade, a reflection of the similar terrace higher up the slope. 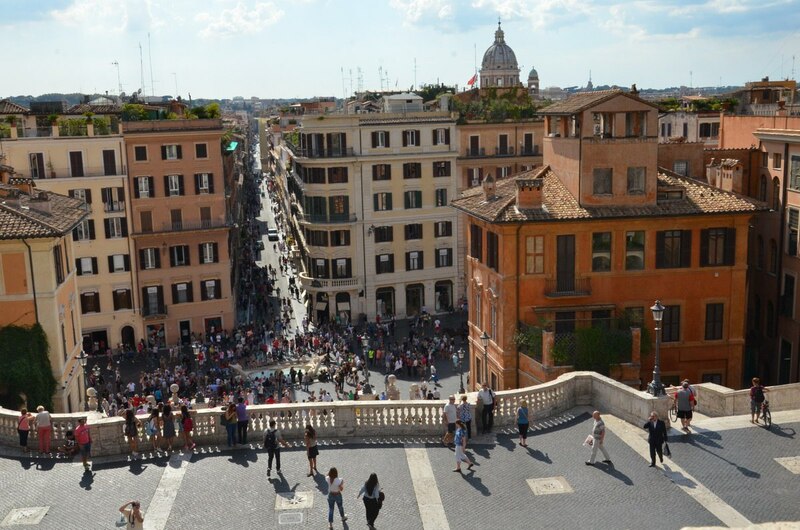 From there, we had an outstanding view of Piazza di Spagna and Fontana della Barcaccia below. 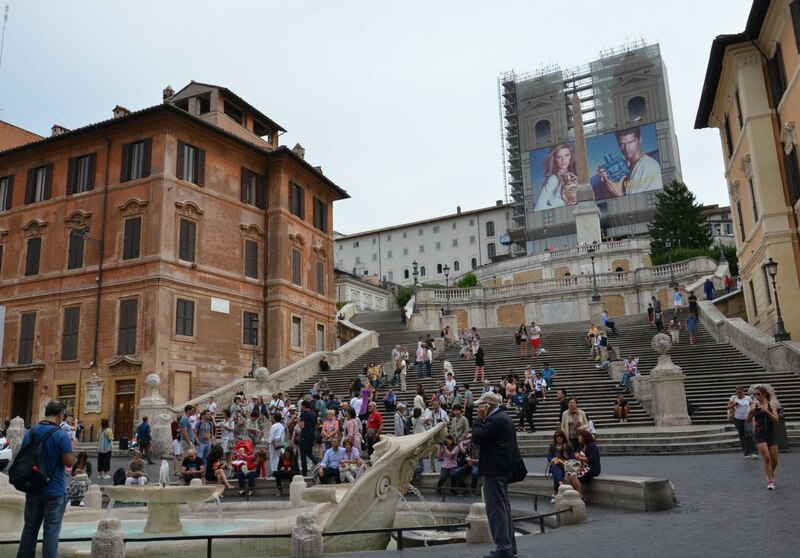 Designed as a gathering place when built in 1723, the Spanish Steps still attract hundreds of people daily, both night and day. Perhaps that can partly be attributed to the fact that an entrance to the subway exits off the piazza as well. 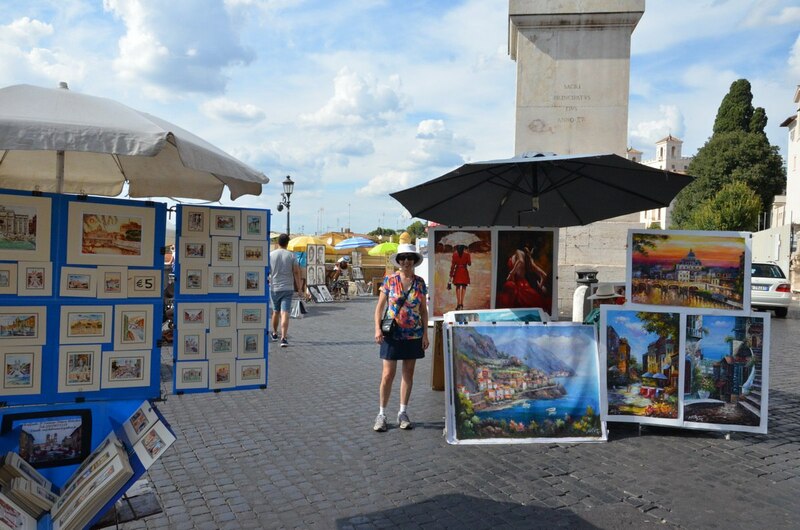 At the top of the Spanish Steps, and occupying Piazza Trinita dei Monti, is an assembly of artists selling their works, portrait artists working on caricatures, and other crafters with creations for sale. In the blistering heat, Bob and I did not contemplate the pieces for long before we completed a circuit that eventually had us descending the hill in another location and making our way back to our room for a rest.